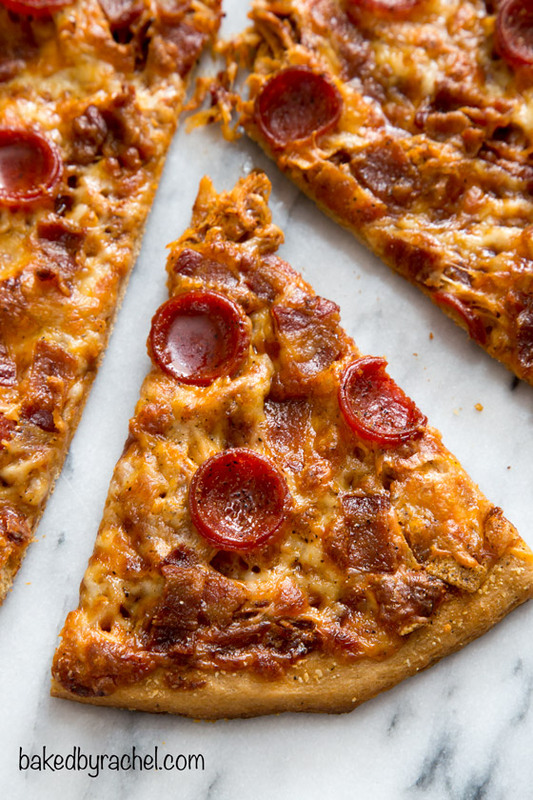 A spicy barbecue chicken enchilada pizza with salty bacon, thick sliced pepperoni and three kinds of cheese over a thin homemade whole wheat crust. It’s pizza Friday! So, it’s time for a full flavored loaded pizza on whole wheat crust. A perfect combination of healthy and indulgent. Don’t skip pizza night, just include a tasty homemade whole wheat crust! I’d like to say it’s easy as pie but I know pie scares some people so let’s just say it’s easy. Stand mixer or by hand, you can make this dough for the perfect crispy thin crust whole wheat pizza. I combined three of my all time favorite pizzas into one because why not? My original love is pepperoni. Eventually I transitioned to barbecue chicken and bacon makes it SO much better. But, after creating the ultimate chicken enchilada pizza it was really hard to go back to anything else. Only, one day I combined them all into one glorious pizza. I knew I had to recreate it and share it here because it was incredible. Perfectly sweet and spicy with a crisp whole wheat crust. 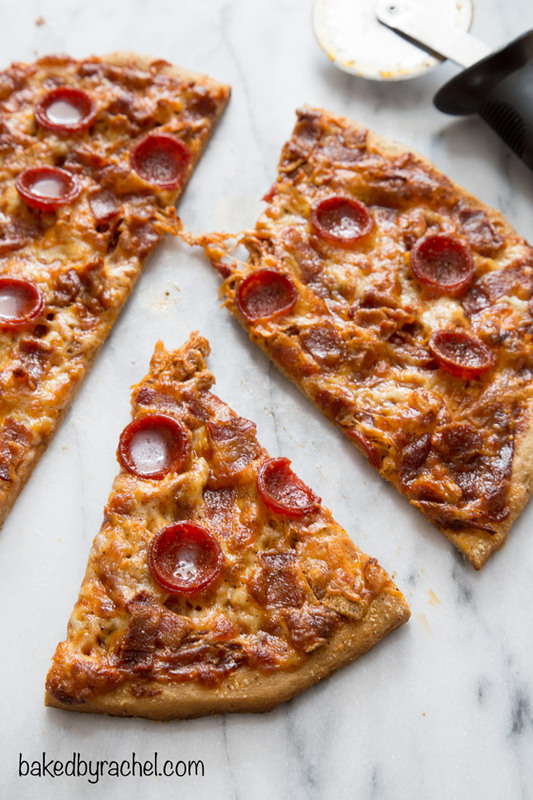 This whole wheat barbecue chicken enchilada pizza has it all… an easy homemade whole wheat crust, spicy shredded enchilada chicken, sweet and spicy barbecue sauce, thick sliced pepperoni, salty bacon and three varieties of cheese. Be sure to add this to your pizza night! Heat 1/2 cup water to 115°F. Dissolve yeast and honey in water. Allow to proof for 5-10 minutes. In a large bowl or stand mixer, combine 1 cup white whole wheat flour with salt. Slowly mix in liquid, mixing until a smooth ball forms. Add additional flour or olive oil as needed. Transfer to a greased medium bowl, cover and allow to rise for 1 hour or until doubled in size. Add chicken, broth and spices to a small saucepan. Cook over medium heat until chicken is cooked through. Shred chicken and return to pan. Continue cooking over medium heat until the liquid has cooked off. Transfer chicken to a small bowl, set aside. 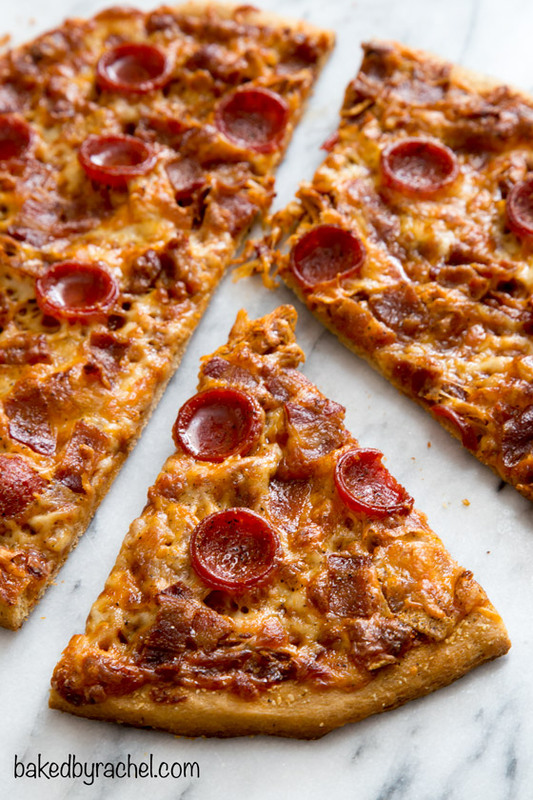 Prepare barbecue sauce, bacon, pepperoni and cheese. Grease a large baking sheet. Shape dough to desired size on prepared pan. Spread barbecue sauce throughout, leaving a border for crust. Sprinkle with Parmesan cheese. 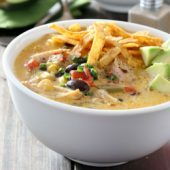 Top off with shredded seasoned chicken and optional seasoned tortilla strips. 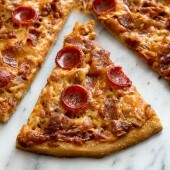 Coat well with mozzarella and Monterey Jack cheese, followed by pepperoni and bacon. Lightly sprinkle with ground black pepper. Bake for 15-20 minutes or until desired crispness is reached. Slice and serve immediately. *If using store bought barbecue sauce, add 1/4 tsp black pepper and 1/4 tsp cayenne pepper. Yay for both posting healthier pizzas today! But you definitely win with the enchilada and bacon combo. That just sounds down right MAGICAL. Pinned! Yum! I’m always looking for a good whole wheat crust to make in place of the quicker alternative (frozen or delivery). 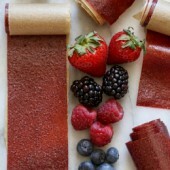 And of course whole wheat is much healthier, I’ll have to try this one out! Love this!! Passing it to my Hubby – the pizza maker in this family! :) Have a wonderful weekend, Rachel! This thing is gorgeous! LOVE your pizzas! Right? I couldn’t resist combining them all. Now it’ll be hard to go back! 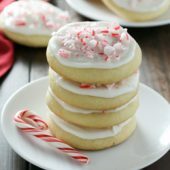 I am dying over here, this looks delicious! That pepperoni looks amazing, and this pizza sounds awesome! I went to the store the other day to find pepperoni like this but couldn’t find any. Where do you get yours Rachel? Thanks so much Karen! I’ve noticed that not all stores carry stick pepperoni. My local store carries it while another a little further away does not. So, I’d recommend check another store. It could be in a variety of places depending on the store, but most likely near the pre-sliced packaged pepperoni. Sounds good, does the barbecue sauce add sweetness? I would think enchilada sauce would work too. The barbecue sauce isn’t overly sweet and adds a nice spice to the mix. However, store bought can also be used with additional spices added to spice it up. If preferred, I already have a chicken enchilada pizza that includes a homemade enchilada sauce. Love this! If it’s anything like the regular chicken enchilada pizza you made me when I visited you, then I’m sure this one is just as amazing! can you make the dough ahead of time and if so, should it be refrigerated until use? You can and if you do, definitely chill it until the day you plan on using it. Let it come to room temperature prior to shaping.